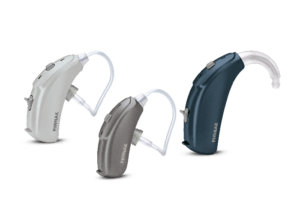 At Hear Care, we are proud to offer Phonak Hearing Aids to our patients in Warwick and throughout Rhode Island. Phonak offers behind-the-ear and receiver-in-canal hearing aids to treat varying degrees of hearing loss, as well as one made for children. Phonak offers products for educational purposes, to improve accessibility for students: wireless microphones and receivers improve the classroom environment for children who wear hearing aids. Their Cros II model is designed specifically to treat single-sided deafness, enabling wearers to feel more confident in their environment. 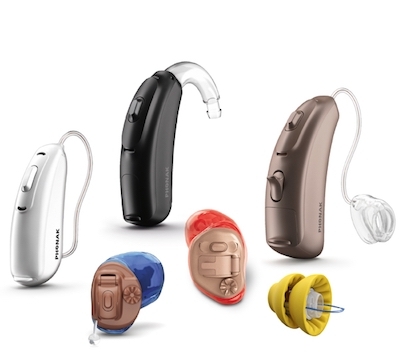 Founded in 1947, the Swiss manufacturer Phonak has been committed to changing lives and reconnecting people to their passions and loved ones with state-of-the-art hearing technology. Phonak continues to grow and innovate, and has made the promise to not rest until “wearing a hearing aid is as simple and routine as eyeglasses or contact lenses.” As an international hearing aid manufacturer, Phonak takes in feedback from hearing aid wearers and hearing professionals across the world, using this knowledge to inspire their newest models of hearing aids. With their partners, Phonak also works to break down the stigma attached to hearing loss. Phonak’s hearing aids are outfitted with a range of programs that adjust depending on the environment, from being in a crowded space to a quiet car, allowing for flexibility in volume. Most of their products feature wind and echo blocking programs, as well as a zoom to focus on specific voices, sounds, or conversations in challenging environments. With an array of style, wireless technology, and color options, including different skin tones, Phonak hearing aids are both powerful and discreet. The new Marvel platform means that the latest hearing device from Phonak, the Audeo Marvel, will give you a rich sound experience without limitations. Not only are the Audeo Marvel’s individual features something to get excited about, but the combination of these features into one cohesive system will bring you the best listening experience. While the AutoSense OS 3.0 technology scans the listening environment, and automatically adapts to provide you with a personalized listening experience, the Binaural Voicestream Technology streams the full audio bandwidth bidirectionally. Phonak knows that two ears are better than one, and this new technology empowers you to use both your ears to hear all the sounds around you. Virto B-Titanium is the first custom hearing aid made from lightweight, durable medical-grade titanium. Half as thin as traditional acrylic shells, the new titanium hearing aid is the smallest custom hearing aid ever produced by Phonak. Interested in Phonak Hearing Aids? Contact us today to schedule a hearing test with our Audiologist Laurie Duffy. At your appointment, Laurie will thoroughly assess your hearing and help you find the right hearing aid for you.